With summer in full swing getting kids to sit and read can be difficult. However August is only days away and the count down to school will begin. 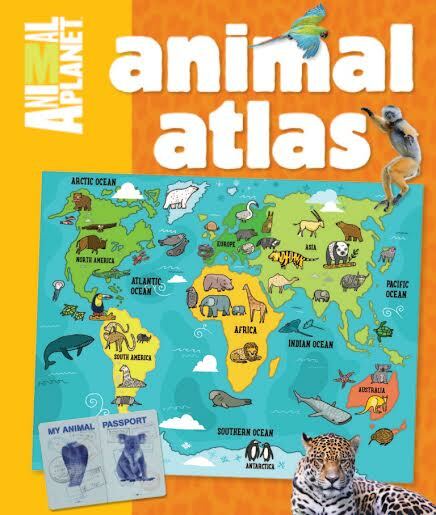 Giving kids quality, engaging books to foster the love of reading is so important and Animal Atlas by Animal Planet is a pretty awesome book! Let animals take your kids on a tour around the world thanks to this inventive guide from the folks at Animal Planet! This kid-friendly atlas introduces a surprising amount of information about cool creatures and their unique habitats. The colorful maps, vivid photographs, animal glossary, and tons of bite-sized facts add up to a book that will delight and inform younger readers. For the summer I like to set up a book bin and switch out the books on a weekly basis. My five year old will often just sit and pull out books to look through or ask one of the older crowd to read to him. Animal Atlas has been in the bin and has been pulled out several times over the last few weeks. The colorful pictures of all the different animals. When the school year starts I plan on using this for geography and science in our kindergarten. The book covers animals from the seven continents and oceans as well as the different biomes and world map. By adding our globe to the mix I know my son will love finding out where all the wonderful creatures live. We will use this in conjunction with the Animal Bites Books I reviewed a few weeks back. I really love my two cats very much. They keep me company all the time. My middle loves the giraffe and the dolphin. My son would ware this out!